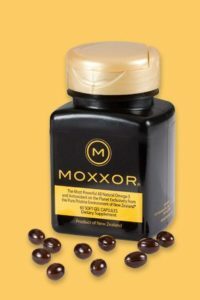 Moxxor is a marine-source Omega-3 supplement cold-pressed from New Zealand green-lipped mussels. It’s my favorite form of Omega-3s, in part because the capsules are tiny compared to fish oil and even krill oil gel caps, yet they pack more anti-inflammatory power than most other forms. Although the milligram amounts are smaller (about 1/3 the typical giant fish oil supplement! ), the constituents are so concentrated and so highly bioavailable that it is just as effective. In fact, in my personal experience, I find it works far better than other forms of Omega-3. If you do try Moxxor, here are the ways I suggest using it. If you (or other human family members) have not been taking any Omega-3s supplements prior to starting Moxxor, then it may be helpful to take four to six capsules per day until the body gets “caught up,” then reduce to the standard two-per-day regimen. You may also want to start at a higher level if you have a specific health condition you want to address. For cats or small dogs in a state of Omega-3 deficiency, give up to two capsules per day; for larger dogs, up to four capsules per day. For a healthy cat or small dog, one capsule every one or two days, is perfectly adequate. For larger dogs, one or two capsules per day is sufficient. For people or animals facing a health challenge, of course, more may be better (though Moxxor is very concentrated, so there’s no need to go overboard!). Omega-3s benefit the heart, kidneys, skin, nervous system, and immune system. Therefore, a higher dose of Omega-3s is may be helpful for pets with similar issues. Give up to two capsules per day for cats or small dogs, or 6 capsules per day for large dogs. The Moxxor capsule’s tiny size makes it easy to take yourself, as well as to give to pets directly by mouth. Its mild but intriguing smell may even make it a fun treat for some animals to eat, all by itself! For very fussy or mouth-shy pets, you can puncture the end of a capsule with a pin and squeeze the oil onto food; mix well for very picky pets. If you find it hard to squeeze the tiny gel caps, you may want to use pliers or similar tool to get the most oil out. I recently re-discovered the utility of a pill gun for my cat, who at 17 is getting rather crotchety about taking any oral supplement. He is very strong and still has very sharp teeth… that way, he gets his daily Moxxor, and I keep my fingers! And that’s it! Simple dimple! Of course, always let your veterinarian know what supplements you are giving your pet. Note: While most veterinarians will advise you to stop Omega-3 supplements before any planned surgical or dental procedure, please note that Moxxor does not have the blood-thinning effects of other marine oils. Click here to order a 30-count bottle, and use coupon code DRJEAN to get 5% off! Full disclosure: I am a member of Moxxor’s Advisory Board, and receive a small commission on sales.